Thailand is a great place to relax. It’s also a great place for cruisers to get stuff done. It has been 18 months since Sophie left New Zealand, which is the last place where we had significant work done on the boat. 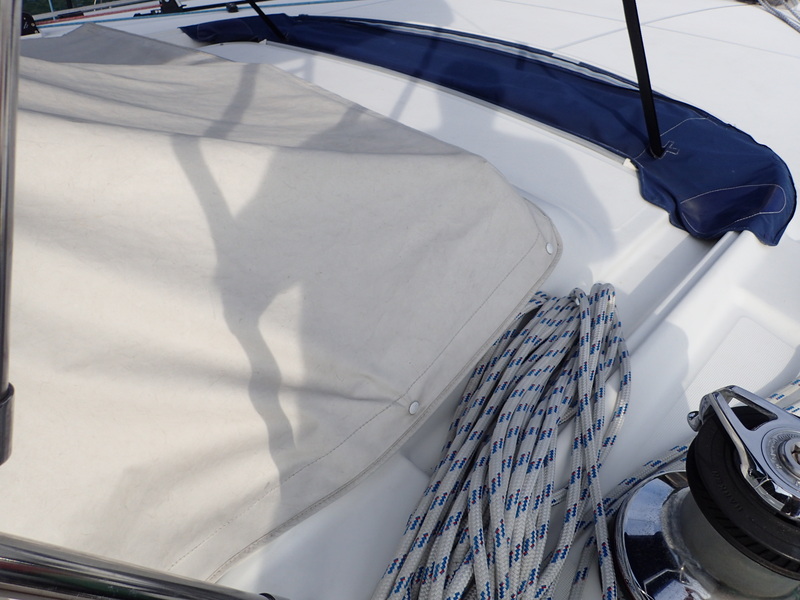 Most of the repairs we did in New Zealand were structural in nature, including re-glassing some bulkheads, machining our roller furling foil, machining our boom gooseneck, and installing new rudder bearings. 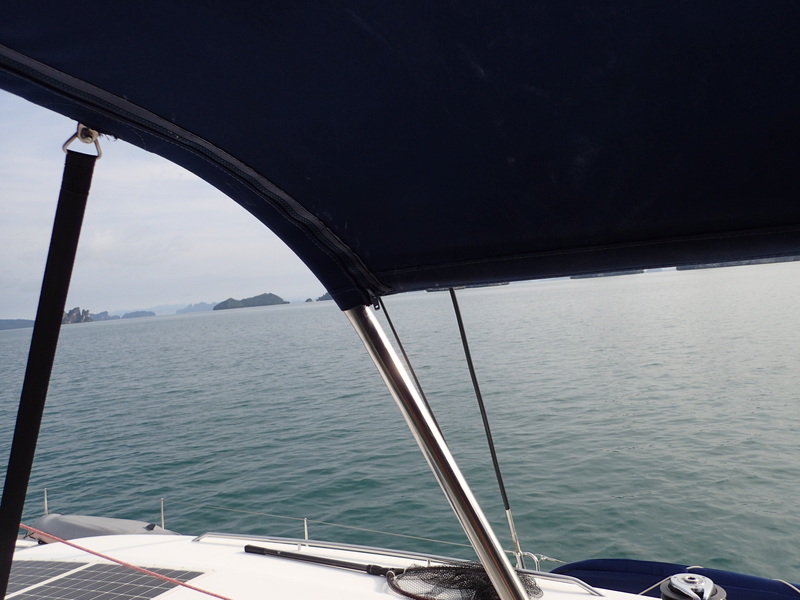 Now that we are in Thailand, it’s time to take advantage of the excellent and inexpensive marine services industry here and have some new work done to our home. Most of the additions to Sophie this time are in response to the ongoing, relentless onslaught of the tropical sun. We are very excited about these upgrades, which are making our home look shiny and new. Sophie is our home, our classroom, our workplace, our movie theater, our garage, our laundromat, our power plant, our municipal water and sewage service, and our dance floor. Don’t forget about the dance floor part. 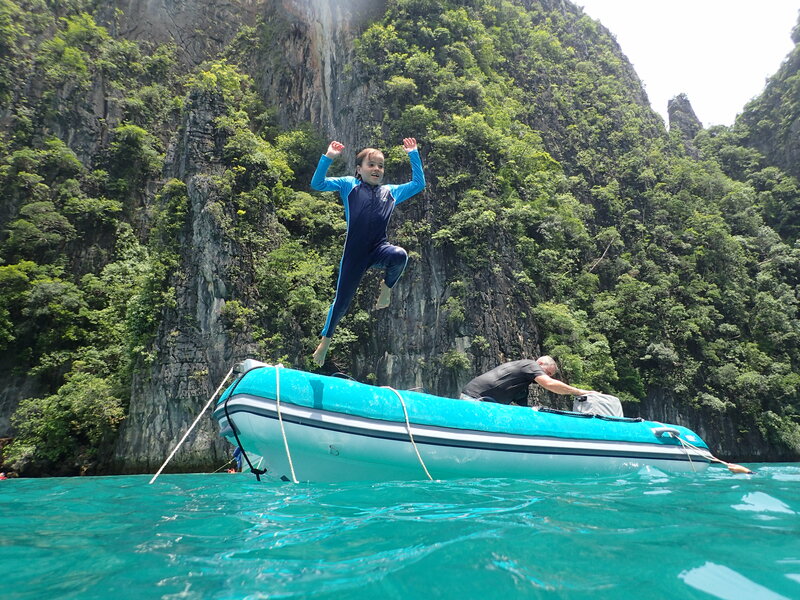 It’s the platform for Sophie Adventure Cruises, our nickname for how we go about sharing our lives with friends and family. Any time we do upgrades here, it’s a big deal for us. We’ve just done some upgrades that make us happy in a Christmas morning-kind-of-way. Let me walk you through what we’ve done so far. Sophie has a new dinghy! When you are out cruising, your dinghy is your car. You use it for everything. Sophie’s old dinghy was a Walker Bay Genesis RIB with a 20 HP Honda four stroke outboard. We bought it new in 2008. It was a great dinghy for a long time, but over the last two years it’s fabric began to fray, it’s hull began to leak, and the engine became so finicky that I was the only one in the family (including #Stepheniswinning) who could start it. Jenna, in particular, did not enjoy having a dinghy that she couldn’t start, especially after she was caught out in rain squalls once or twice. So for the last six months we’ve been dinghy shopping. 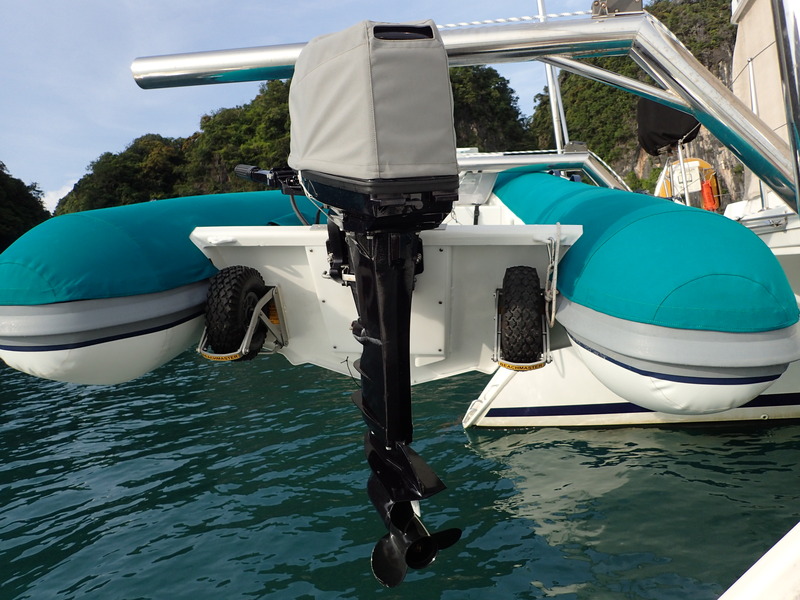 We settled on a Highfield Ocean Master 3.5 meter RIB with a 30 HP Tohatsu 2 stroke outboard and Hypalon tubes, all purchased from Cholamark Boats in Phuket. We first rode in a Highfield with our friends on Nalukai last Christmas. 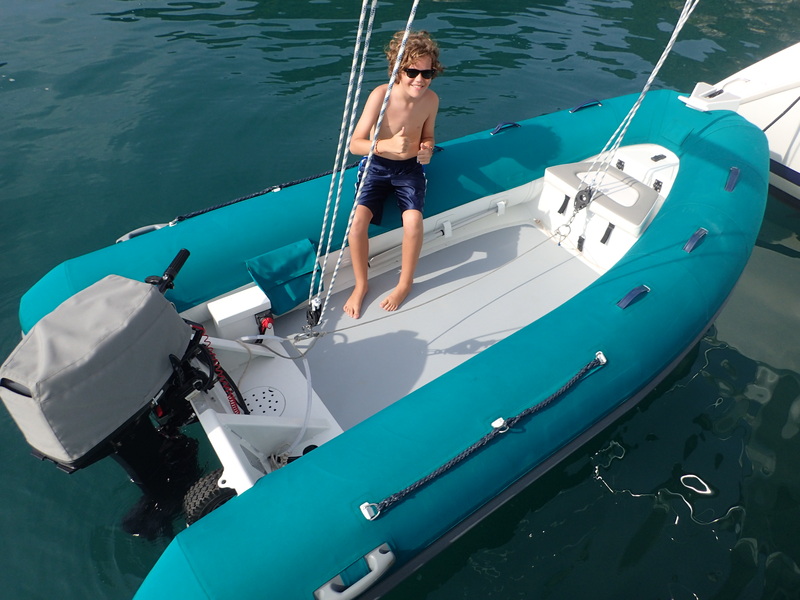 Our new dinghy has a heavy duty, reinforced aluminum double hull, which will be strong enough to withstand the demands that Sophie Adventure Cruises puts on a tender. 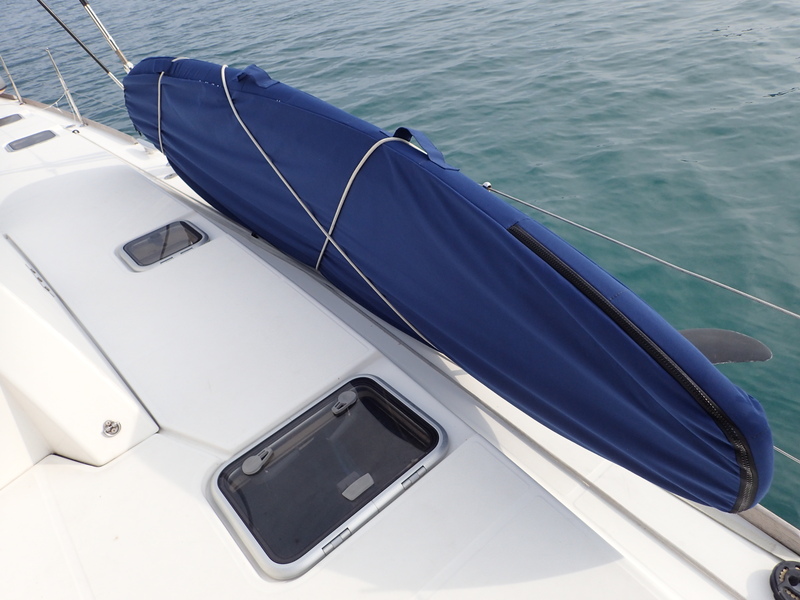 We also ordered a Sunbrella tube cover in “Sophie Green” along with a grey engine cover. 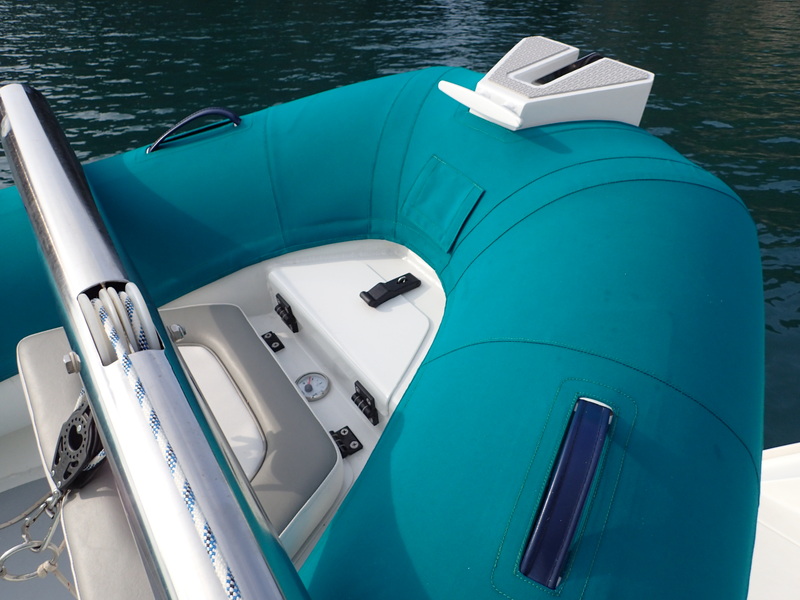 The boat is designed for a center console with steering wheel, but we decided to forego this option. The result is a cavernous interior that will hold 8 adults, and we think that the Tohatsu has enough oomph to get up on a plane with such a heavy load. Please also note the aluminum transom reinforcements, the multiple welded attach points for lines, and the nonskid surface on the deck. We like the design of the bow. It features a cushioned seat with an integrated 35 liter fuel tank and fuel gauge. Above that is a nonskid bow platform with a cleat and anchor roller. It’s now quite pleasant to step down from the dinghy onto Sophie’s transom. The bow platform also makes an excellent launch pad for doing can openers. 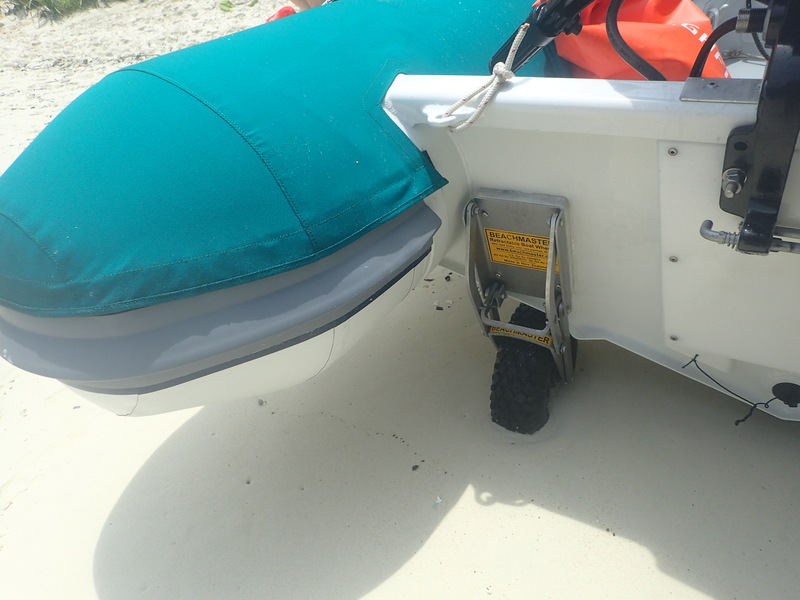 On the transom, we mounted Beach Master retractable wheels. (Yes, I know, an Ocean Master needs a Beach Master.) These are made in New Zealand and are easily the strongest dinghy wheels we’ve seen yet. 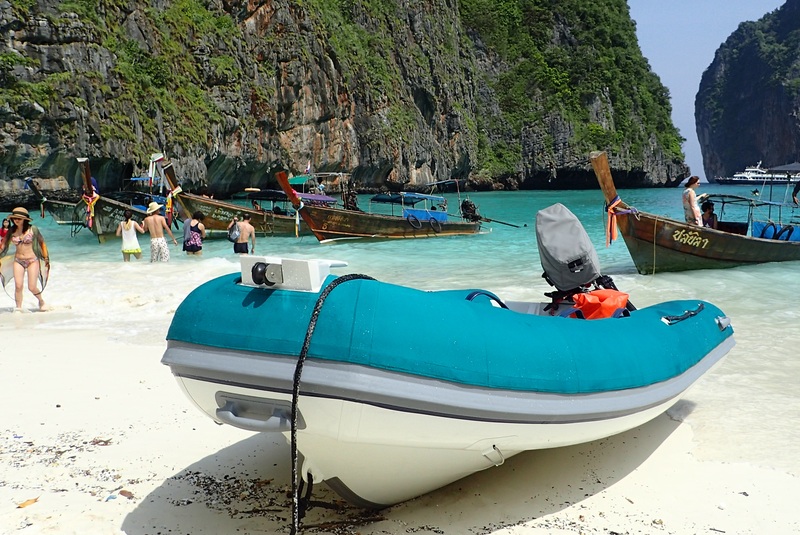 They’ve worked flawlessly on five beaches so far, including a landing amidst the chaos known as Maya Beach on Phi Phi Le. The only downside to this arrangement is that the weight of the fuel tank is now located in the bow, requiring someone with the strength of a bull to lift and pull from the front of the cart. 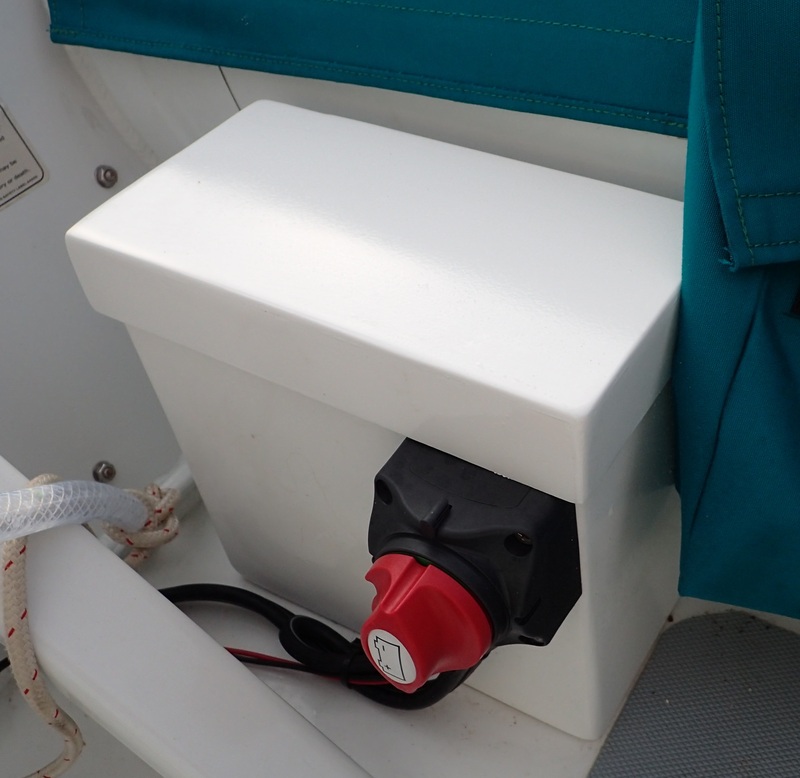 The best part of the new dinghy? It has an electric starter, powered by a battery located in this cute little box. Actually, this is a wonderful feature, especially after the last 5 months of prayers and frustration that were often required to get our old dinghy running. The best part of the new dinghy is the confidence it gives us to go longer distances, crushing through waves in the process. We’ve already done a 10 mile trip with #Stepheniswinning, and we hope there will be many more to come. We liked the idea of buying a new dinghy so much, we bought two! 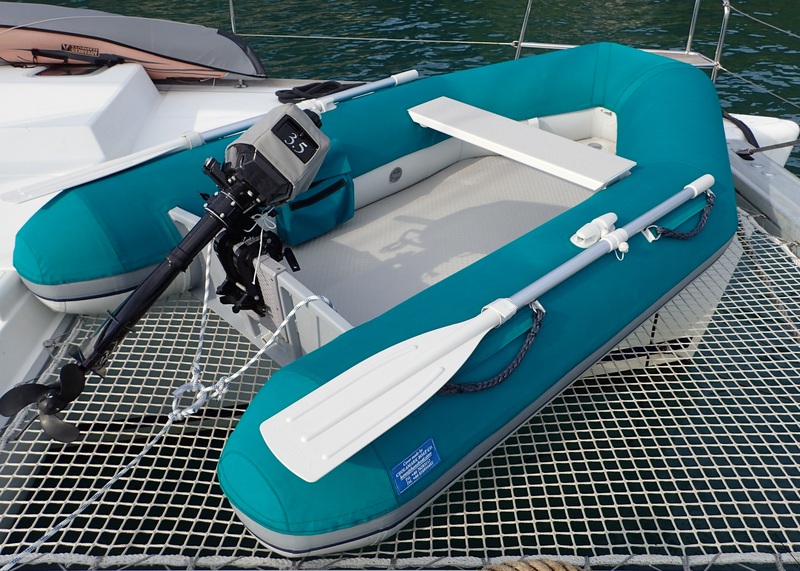 This is a Highfield 2.5 meter Roll-Up with Hypalon tubes, a 3.5 HP Tohatsu 2 stroke outboard, and Sunbrella covers that match the covers on her older sibling. We call this craft “The Baby,” and the name works. The Baby weighs 50 pounds, including the motor. When we are underway, we can deflate The Baby, roll it up into a bag, and store it in a locker. We will mount the engine on a stern rail. The tropical climate has been especially harsh on our exterior cushions over the last two years. The stitching was disintegrating, interior foam had deteriorated, and the white vinyl surfaces had turned a grayish-black. I had tried every combination of cleaner-detergent-vinegar-bleach-shamanism imaginable, but the original color wasn’t coming back. So we replaced them all with new cushions made from closed cell foam and with a slightly more ergonomic design. The overall effect is to make Sophie look brighter and cleaner. 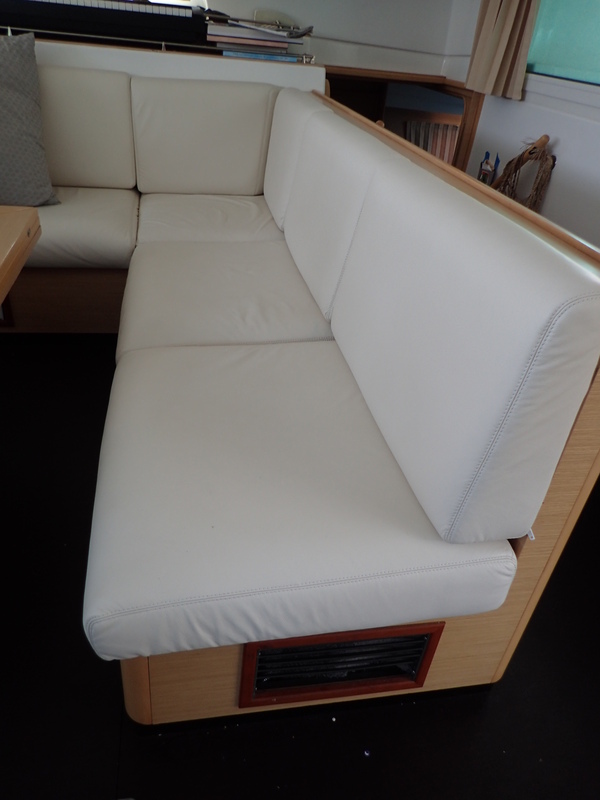 For the flybridge, we even added circular cushion back rests. These make Jenna very happy. The forward cockpit looks clean and inviting, especially for couples at sunset. The aft cockpit looks like children have never visited the boat. For now. 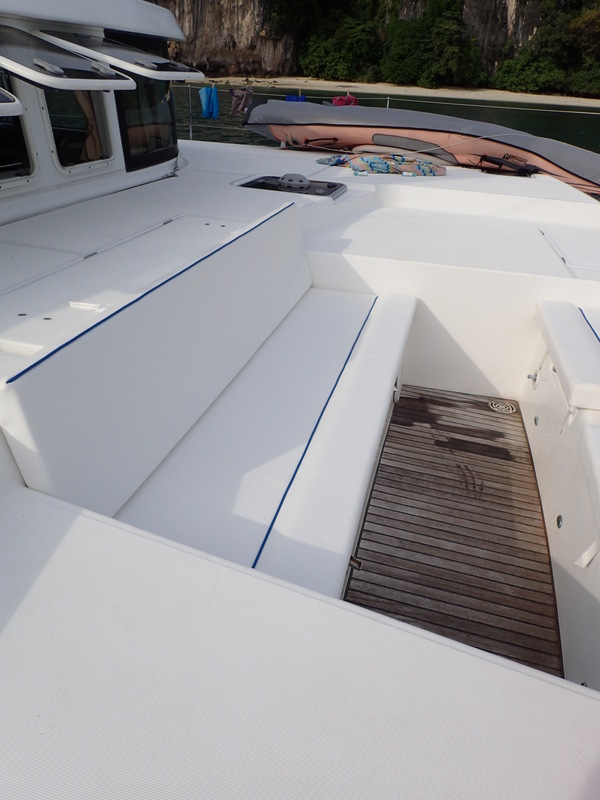 Sophie’s flybridge, the place up top where we steer and sail the boat, is very exposed to the sun. Some of the material up there required repairs or replacements. 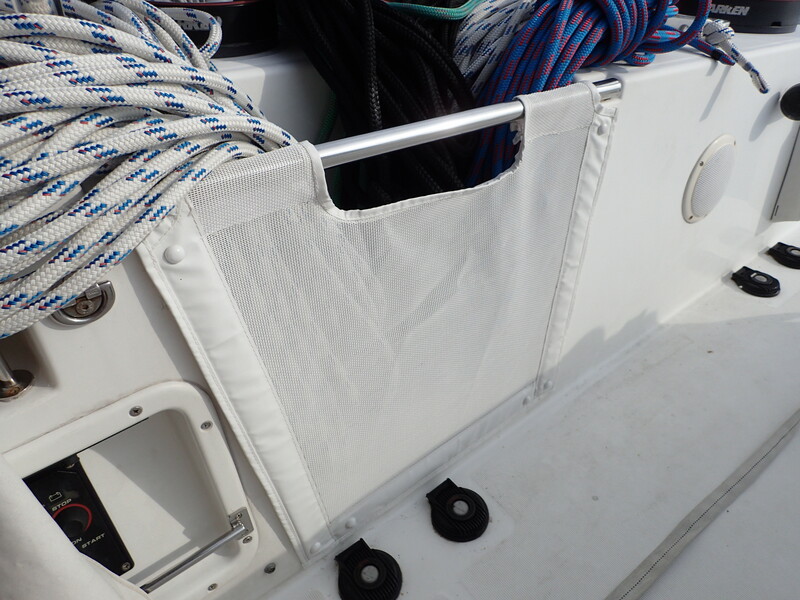 Our bimini, which we rarely used in Seattle but has been up pretty much nonstop for the last the three years, was starting to lose it’s seams and stitching along the zippers. We had them all repaired. The same goes for our wheel cover. We have mesh netting on the rope wells on either side of the wheel. The old netting had disintegrated. The new netting looks quite nice. We love our stand up paddleboards, but the plastic travel bags we bought for them in San Diego 30 months ago started to leave a trail of silver dust behind them wherever they went. Two months ago, they literally disintegrated and turned to dust wherever you touched them. These new covers are made from Sunbrella and will hopefully last longer. Sophie’s salon cushions and master cabin couch cushions were originally covered in ultrasuede, and we could run these cushion covers through the washing machine whenever they started to get dirty. But the tropics eventually took their toll, and everything soon became a dull, spotted grey. 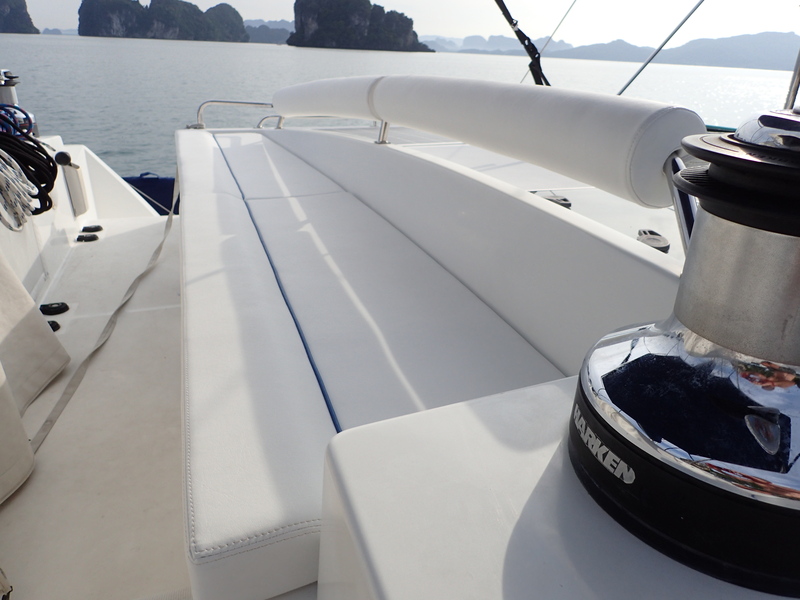 We met some friends in Langkawi who had switched to leather about four years ago, and their interior looks great. We decided to take the plunge. From my perspective the salon looks brand new, but I am a little scared to sit on them. I think that the sofa in our cabin looks great as well. I especially like Hazel’s invention for opening cabinets at the pull of a string. Not all of our Thai cosmetic upgrades happened to Sophie over the last month. The crew got some cosmetic upgrades as well, in the form of tattoos. As we’ve mentioned previously in this blog, we’ve added five tattoos to Sophie’s crew since we started this adventure. Jenna, Dan, Max, Becca and I all got tattoos in French Polynesia. 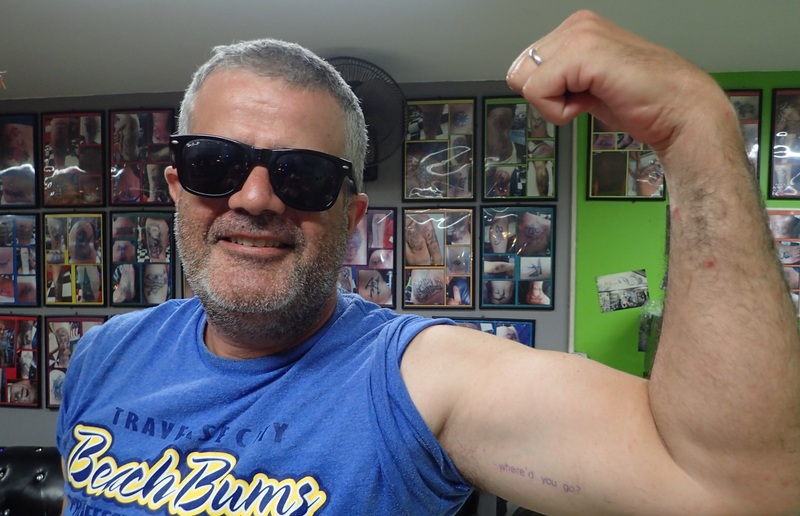 Now that we are in Thailand, #Stepheniswinning and I decided early on in his trip that it was time for two more. 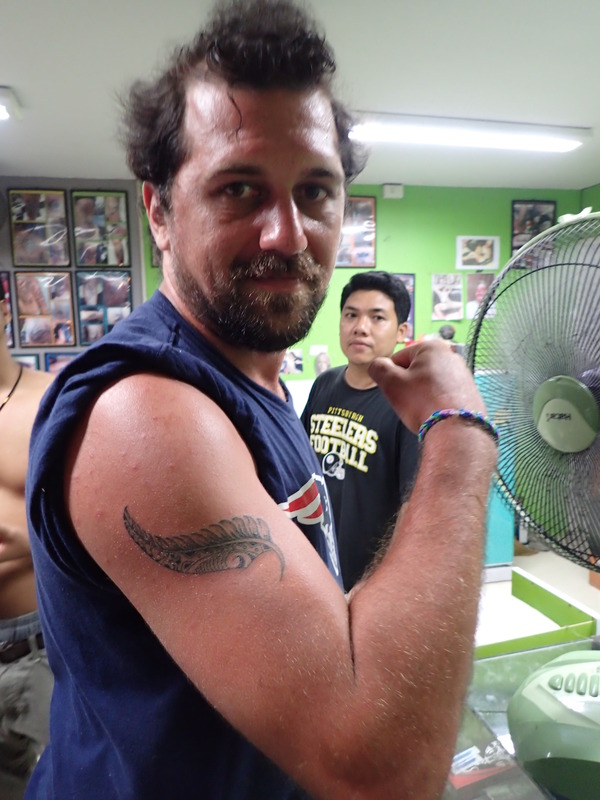 We found an interesting tattoo parlor in Phi Phi with an excellent artist who used traditional bamboo and decided to give it a go. This is Stephen’s first tattoo, and we all really like the design. It was also a little scary watching a guy wearing a Steelers shirt jab bamboo needles into the arm of a guy wearing a Pats shirt. But it was all good in the end. This is my eighth tattoo and the second one that is not cancer-related. Some day I plan to have as many tattoos that I chose as I had from my cancer treatment. “Were’d you go?” is the chorus to a Clash song I used to sing with my older children when they were kids. It’s a reminder to me that I have a bigger family than the ones who are fortunate enough to be with me right now. It’s about travel, expectations, culture, experience, separation, loss, and hope. To me, it’s perfect. Just like all of the fancy new upgrades to our little floating home. 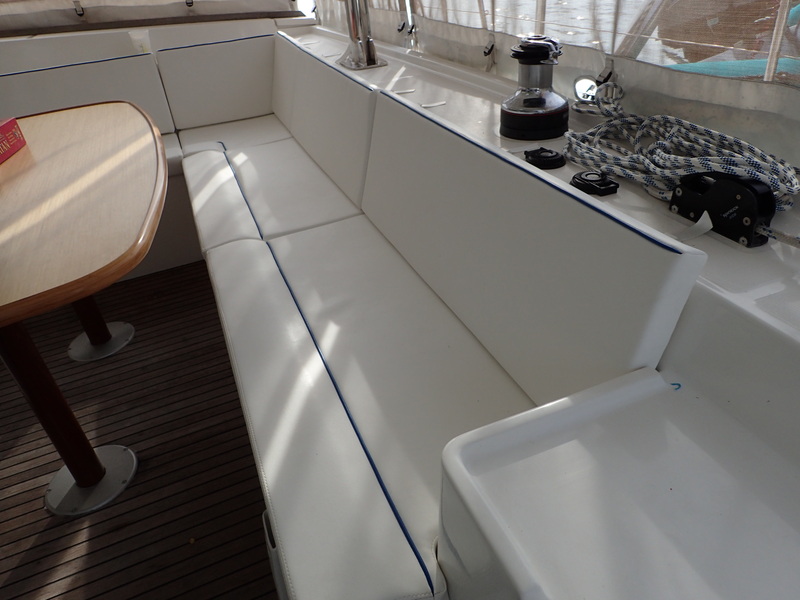 New dinghies, cushions, canvas, leather, and ink. Have I mentioned lately how lucky we are? 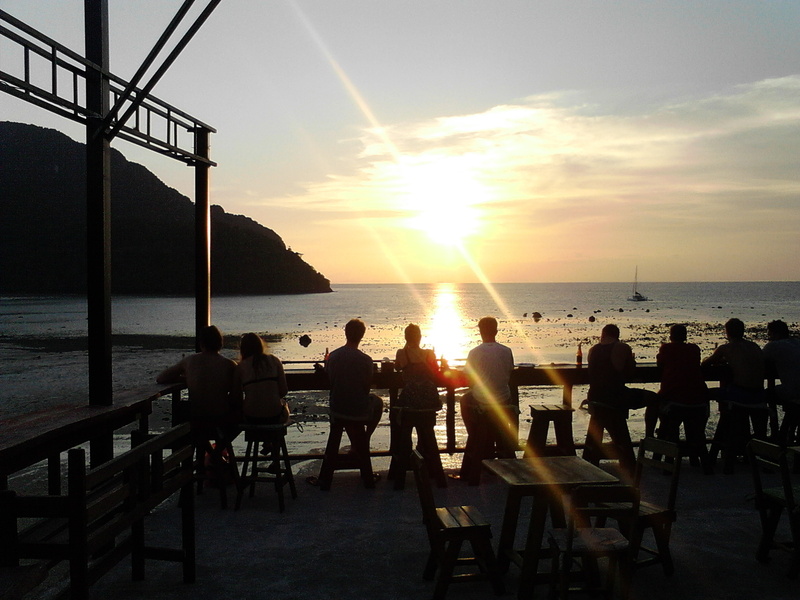 This entry was posted in Uncategorized and tagged canvas, dinghies, Kids on Boats, Langkawi, makeover, Phi Phi, Stepheniswinning, tattoos, waypoints by Jamie. Bookmark the permalink. You are blessed! Carpe Diem! Why two stroke? Lighter, more power and less things to go wrong I assume? Oh yah, and no emission standards correct? Miss you all….